I used American Apparel Hassid as a base, with Pure Ice Wild Thing and Nubar Forest mixed for the heart monitor line. Topped it off with only one coat of Seche Vite top coat, since I was in a hurry! Wow love it haha, very creative! cool! you should do star treck nails! I like Iris' idea of Star Trek nails! I'm a huge trekkie so I approve! I was thinking that you should do mini nail polish bottles on your nails. You could do your favorites or the ones you use the most. thats awesome! reminds me of House! I was trying to say it to each beat of the line. That is sssoooo amazing imagination. I wouldn't have thought of it.I'm so glad that you're here to show it (or hear it lol. )your passion and for you to share it with the rest of us. To give us hope and good ideas.Keep up it.Looking forward to your blog each day. It's just a whole new adventure just to see what's next. From your oregon viewer. star trek nails would be cool but what about something to do with star wars!!! after all my sons name is anakin! I had also thought of mini nail polish bottle's, and star wars nails would be cool too! another thing I thought of was faces, happy, sad, etc.! It's very, very cool!!! I loved it! 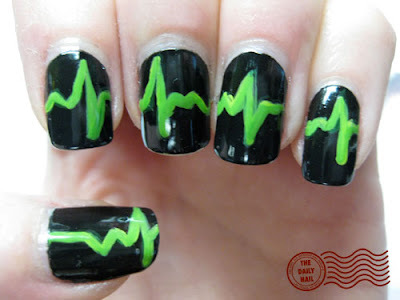 !I remembered my last electrocardiogram! So cute! I love it. Star Trek nails sound AWESOME...I'm not sure how you'd actually do them, though. Maybe the federation logo? hi! i love seeing all your wicked nail creations every day! thanks so much for doing what you do! i tagged you in my lated blog post, i'd love it if you would repost this and add some three's of you!